Oracle IAS, the best coaching institute for UPSC/IAS/PCS preparation in Dehradun brings to you daily answer writing practice. 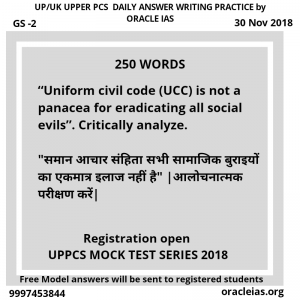 Oracle IAS, the best coaching institute for UPSC/IAS/PCS preparation in Dehradun brings to you daily MCQs. Answers would be updated in the evening. 1.Which of the following techniques can be used for rainwater harvesting? 1. Guiding the rainwater to bore wells. 2. Using the surface storage bodies like irrigation tanks. 3. Using rooftops for water collection. 1.निम्न में से कौन सी तकनीकी का उपयोग वर्षा जल संचयन के लिए किया जाता है? 1.Which of the following statements is/are correct with regard to temperature distribution over oceans? 1. Temperature decreases from equator to pole because of decreasing trend of insolation. 2. Oceans in southern hemisphere receive less heat due to their less contact with land. 3. Winds blowing from land to sea increase the sea surface temperature near coast. Select answer using the code given below. 1.महासागरों पर तापमान वितरण के संबंध में निम्न में से कौन सा कथन सही है? regarding the administration of the affairs of the union. 1. Which of the following women and their contributions to freedom struggle are correctly matched? 2. Pandita Ramabai: organized Secret Congress Radio during Quit India Movement. 1. All planetary winds are blowing from east to west. 2. They change their position as per the apparent movement of sun. Exp: Some are westerly and others are easterly as per the position of low pressure and coriolis force. Apparent movement of sun changes the position of low pressure and high pressure and hence that of the trade winds. 1. Which of the following will increase the population of a community in a region? Exp: Emigration and Mortality will decrease the population. Rest will increase. Which of the following comes under ‘factors of production’? capital come under factors of production. Congrats for visiting this page! Your being here shows your sincerity and dedication for UKPCS, which would bear fruit once your preparation meets the right opportunity. The most important and most neglected part for Civil Services Preparation is answer writing. It is not about HOW MUCH YOU STUDY but CAN YOU WRITE within word limit and time frame. Today’s questions are from paper-2 (History) of UKPCS Main Exam Syllabus. Great effort and well structured preparatory course!